Cut the pizza dough into 1/4-inch wide strips. Thread 3 meatballs onto each skewer to hold meatballs in place. Wrap and criss-cross the stripes of dough around the meatballs, leaving a small portion of the meatball exposed at the top end where the eyes will be placed. Place mummy meatballs on the baking sheet and bake for 18-22 minutes or until golden brown. While the mummies are baking, create 5 pairs of eyes. Slice string cheese into 1/8 inch thick circles. Place a piece of chopped olive onto each circle of string cheese. Set aside until the mummies come our of the oven then add the eyes to each mummy’s face. Remove from oven and brush with melted butter if desired. Place a set of eyes* onto each mummy’s face. 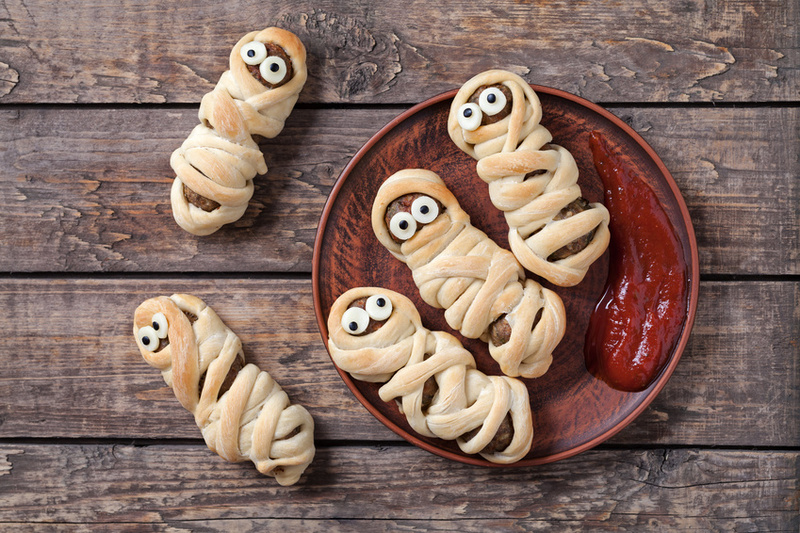 Drizzle with ketchup or other dipping sauce of choice to make them look even more scary! Serve hot and with an array of dipping sauces.